ICW Award for Moment of the Year (2014) – Surprise return at "Shug's Hoose Party"
↑ 1.0 1.1 "Drew Galloway on Facebook: Andrew McLean Galloway the 3rd, prepping Andrew McLean Galloway the 4th for the big match tonight #ImpactonTour". Facebook. 29 January 2016. สืบค้นเมื่อ 17 December 2016. ↑ 2.0 2.1 2.2 2.3 Kamchen, Richard. "Slam! Sports Biography". Slam! Sports. Canadian Online Explorer. สืบค้นเมื่อ 14 October 2009. 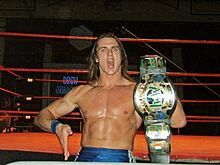 ↑ 3.0 3.1 3.2 3.3 "Drew McIntyre". WWE. สืบค้นเมื่อ 19 April 2018. ↑ 4.0 4.1 4.2 4.3 Schwan, Brett. "Ten Questions With... Drew Galloway". Wrestling Clothesline. สืบค้นเมื่อ 16 October 2006. ↑ "Online World of Wrestling Profile". Online World Of Wrestling. สืบค้นเมื่อ 21 March 2008. ↑ 6.0 6.1 Kreikenbohm, Philip. "OCW Supershow". cagematch.net. สืบค้นเมื่อ 9 December 2015. ↑ Kreikenbohm, Philip. "CAGEMATCH » Wrestlers Database » Drew Galloway » Matches". cagematch.net. สืบค้นเมื่อ 17 December 2016. ↑ "Bad Tidings: Night 1". British Championship Wrestling. Archived from the original on 26 February 2010. สืบค้นเมื่อ 9 December 2009. ↑ 9.0 9.1 "Title History". Irish Whip Wrestling. Archived from the original on 8 June 2009. สืบค้นเมื่อ 10 December 2009. ↑ ""Rebirth" at the York Hall Bethnal Green, London". Real Quality Wrestling. Archived from the original on 25 January 2007. สืบค้นเมื่อ 10 December 2009. ↑ "TV Schedule". Real Quality Wrestling. Archived from the original on 3 January 2007. สืบค้นเมื่อ 10 December 2009. ↑ Jones, Phil. "IwW: Galloway Stripped Of Title". BritWres.com. สืบค้นเมื่อ 27 January 2007. ↑ "Upcoming and Past Fights". SOS Official. สืบค้นเมื่อ 27 January 2010. ↑ Lennie DiFino (12 October 2007). "Conflicting interests". World Wrestling Entertainment. สืบค้นเมื่อ 17 October 2007. ↑ "FCW Results 2008". Online World of Wrestling. สืบค้นเมื่อ 11 December 2009. ↑ 16.0 16.1 "FCW Heavyweight Title History". Solie's Vintage Wrestling. สืบค้นเมื่อ 11 December 2009. ↑ 17.0 17.1 "Champions Roll Call". Florida Championship Wrestling. Archived from the original on 2 January 2011. สืบค้นเมื่อ 1 January 2011. ↑ Keller, Wade (29 August 2009). "WWE SmackDown Report 8/28: Results, star ratings, thoughts, observations, nitpicks, quotebook". PWTorch. สืบค้นเมื่อ 11 December 2009. ↑ Caldwell, James (13 December 2009). "WWE TLC PPV Report 12/13: Complete PPV report on Cena vs. Sheamus, DX vs. JeriShow, Taker vs. Batista". PWTorch. สืบค้นเมื่อ 14 December 2009. ↑ Tylwalk, Nick (20 September 2010). "Few gimmicks, more title changes at Night of Champions". Slam! Sports. Canadian Online Explorer. สืบค้นเมื่อ 20 September 2010. ↑ Tedesco, Mike. "Smackdown Results – 9/21/12". สืบค้นเมื่อ 8 December 2012. ↑ Stephens, David. "Raw Results – 10/15/12". Wrestleview. สืบค้นเมื่อ 9 December 2012. ↑ "WWE releases Superstars". WWE. 12 June 2014. สืบค้นเมื่อ 12 June 2014. ↑ 24.0 24.1 Radican, Sean (8 August 2014). "Radican's iPPV report – Evolve 31 in Ybor City, Fla.: Galloway/McIntyre captures Evolve Title from Hero, plus Sydal/Bourne vs. Gargano". Pro Wrestling Torch. สืบค้นเมื่อ 9 August 2014. ↑ 25.0 25.1 Carapola, Stuart (2015-03-28). "Complete WWNLive Mercury Rising supershow 2015 coverage: the Evolve and DGUSA titles are unified, Hero and Thatcher tear down the house, the women of Shine and Shimmer continue the WrestleMania weekend tradition, and much more". Pro Wrestling Insider. สืบค้นเมื่อ 2015-03-28. ↑ 26.0 26.1 26.2 Trionfo, Richard (24 January 2016). "Complete Evolve 55 iPPV report: first Evolve tag champions crowned, Style Battle concludes, who is the next challenger for Timothy inThatcher?". Pro Wrestling Insider. สืบค้นเมื่อ 24 January 2016. ↑ 27.0 27.1 Williams, Justin (2016-07-16). "Evolve 64 results: Timothy Thatcher vs. Marty Scurll, Matthew Riddle vs. Roderick Strong". Wrestling Observer Newsletter. สืบค้นเมื่อ 2016-07-16. ↑ 28.0 28.1 "Preston City Wrestling 'There Can Only Be One' FULL Results". Wrestle Ropes. 4 June 2016. สืบค้นเมื่อ 17 December 2016. ↑ "Drew Galloway". WrestleZone Scotland. สืบค้นเมื่อ 17 December 2016. ↑ "Breaking News: Drew Galloway Debuts in TNA in Glasgow!". Archived from the original on 30 January 2015. ↑ Powell, Jason. "4/1 Powell's NXT Takeover: Orlando Live Review – Bobby Roode vs.Shinsuke Nakamura for the NXT Title, Authors of Pain vs. DIY vs. The Revival for the NXT Tag Titles, Asuka vs. Ember Moon for the NXT Women's Title". Pro Wreslting Dot Net. สืบค้นเมื่อ 1 April 2017. ↑ Zimmerman, Zack. "8/19 Zim's NXT Takeover: Brooklyn III live review – Bobby Roode vs. Drew McIntyre for the NXT Title, Asuka vs. Ember Moon for the NXT Women's Title, Authors of Pain vs. Sanity for the NXT Tag Titles, homecoming". Pro Wrestling Dot Net. สืบค้นเมื่อ August 19, 2017. ↑ Benigno, Anthony. "Dolph Ziggler & Drew McIntyre def. Titus Worldwide". WWE.com. สืบค้นเมื่อ 23 April 2018. ↑ Burdick, Michael. "Roman Reigns vs. Drew McIntyre". WWE. สืบค้นเมื่อ March 25, 2019. ↑ "DPW Heavyweight Championship". Cagematch. สืบค้นเมื่อ 14 February 2015. ↑ "ICW Awards Night 2014 Review". wordpress.com. สืบค้นเมื่อ 9 December 2015. ↑ "ocwaus.com". ocwaus.com. สืบค้นเมื่อ 9 December 2015. ↑ "Timeline Photos - Scottish Wrestling Alliance - Facebook". facebook.com. สืบค้นเมื่อ 9 December 2015. ↑ Philip Kreikenbohm. "Scottish Heavyweight Championship". cagematch.net. สืบค้นเมื่อ 9 December 2015. ↑ "Joker's Wild 2016 event results". ↑ "UEWA - BREAKING NEWS: Drew Galloway is the new European... - Facebook". Facebook. สืบค้นเมื่อ 9 December 2015. ↑ "European Heavyweight Championship". Cagematch. สืบค้นเมื่อ 9 December 2015. ↑ "WCPW Title". What Culture Pro Wrestling. Archived from the original on 9 October 2017. สืบค้นเมื่อ 3 October 2017. ↑ "NXT Championship". WWE. สืบค้นเมื่อ August 19, 2017. ↑ "Intercontinental Championship - Drew McIntyre". Archived from the original on 10 November 2013. ↑ "WWE World Tag Team Championships - Drew McIntyre & "Dashing" Cody Rhodes". Archived from the original on 19 October 2013. หน้านี้แก้ไขล่าสุดเมื่อวันที่ 23 เมษายน 2562 เวลา 19:06 น.